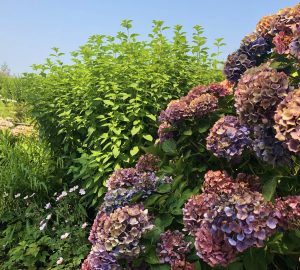 Perennials Archives - Surfing Hydrangea Nursery, Inc. Ten years ago, when I was still gardening full time, most gardens had at least a few shrubby Caryopteris x clandonensis cvs. 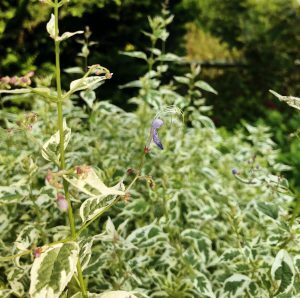 This drought-resistant sub-shrub has grey green, deer resistant foliage during the growing season and airy blue flowers from late summer into the fall. They look great planted en masse, or as accents in perennial borders. But these plants are not without their problems. If not grown in well-drained soil, then can rot over the winter or succumb to phytophthora root rot diseases. And even though they are rated for our zone, long periods of exceedingly cold temperatures over the winter can also severely damage or kill them. But there is a new Caryopteris on the scene, Caryopteris divaricata. Caropteris divaricata is a completely different species of this plant, native to the Himalayas. These are herbaceous perennials, dying completely down to the ground in winter and re-emerging from the crown in late spring. They prefer full sun and fertile, but well-drained soil. The green or variegated foliage has a distinctive aroma when crushed, reminiscent of old asparagus or green peppers. I believe this odor is what makes them so averse to deer. Although they flower late in the summer/early fall, they definitely have their merit. I’ve always felt that using some tall, late-blooming plants in the back of the border is a great way to extend interest late into the growing season. When so many other plants are blooming like crazy in summer, the foliage of these plants allows the eye to rest a bit, which makes the overall composition more enjoyable. We’ve stocked two cultivars in the past: ‘Blue Butterflies’ and ‘Snow Fairy’. I planted a big group of ‘Blue Butterfiles’ in the back of our garden last year, and have been very impressed with how sturdy their stems are and the plants overall size. Year two, they are easily 6′ tall, filling an area between two large Hydrangeas very effectively. I did notice considerable self-seeding this spring, but the volunteers were easily uprooted when they germinated and weren’t any trouble. The flowers are profuse and very pretty when they arrive in September, but certainly best enjoyed close up. I also planted some ‘Snow Fairy‘ in a different spot so that I could compare them. This plant has been a real star. So much so, that I am planning to plant another group further down this year. The best part of this selection is the splash of white in the foliage. When other plants are beginning to look tired with the heat of August, this Caryopteris is coming into its own. 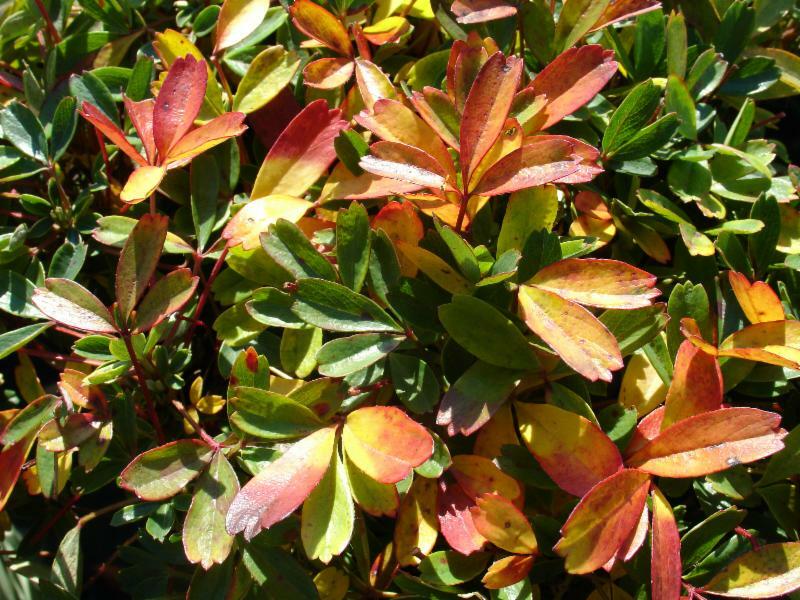 The mid-green leaves have a varying degree of variegation, giving the plant a bright fresh look. ‘Snow Fairy’ is shorter in stature than ‘Blue Butterflies’, making it more versatile. Ours are just beginning to flower at 4′ tall. When there seem to be fewer and fewer plants that are reliably deer resistant, it’s nice to have another plant to add to your arsenal. 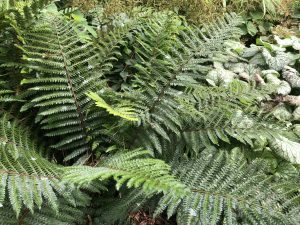 I’d highly recommend giving Caropteris divaricata a try. We sell a wide variety of ornamental plants at Surfing Hydrangea. The vast majority of these are descendants of plants that were collected from Asia or other parts of the world. 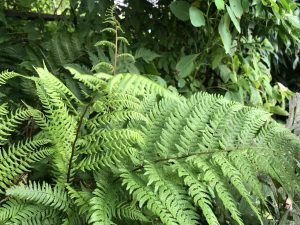 Although exotic plants are beautiful and often do very well here, they are not part of the ecosystem that has developed here since the Laurentide glacier began to retreat twenty thousand years ago. Many of our native fauna depend on the plants they evolved with as a food source and shelter. By planting more native plants we are supporting the animals that have been living here long before humans set foot on the island. Culvers root, Veronicastrum virginicum, is a beautiful plant, native to moist meadows, stream banks and bright woodlands in the North East, that makes a stunning garden plant as well. This plant is particularly attractive to bees, helping to attract more pollinators to the garden. The lance-like leaves of this stately perennial are arranged in whorls, radiating around the stems at regular intervals. In early to mid-summer, spiky white, candle abrum-shaped flowers appear on the top of the 4-6′ tall stems. 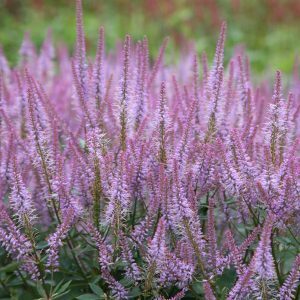 Veronicastrum thrives in full sun in moist to wet fertile soils, but tolerates some shade and average soil is just fine. 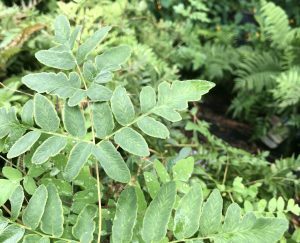 In shady sites, they may require some staking, and don’t them dry out; they will drop their leaves quickly if they dry out even once. 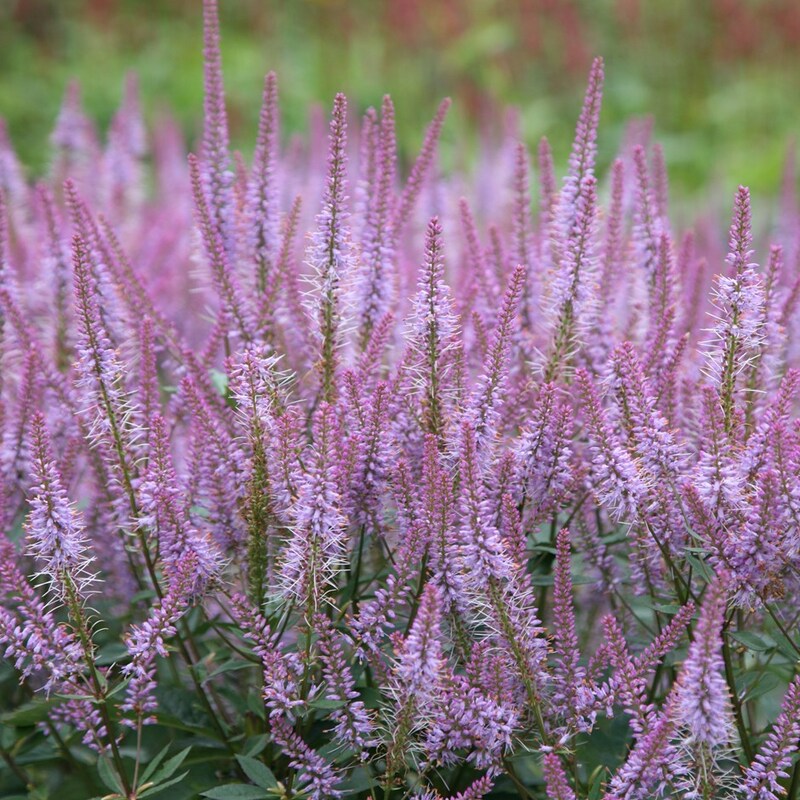 Veronicastrum look equally beautiful in cottage gardens as a “see through plant” or in great swaths in naturalistic plantings in the style of Piet Oudolf. 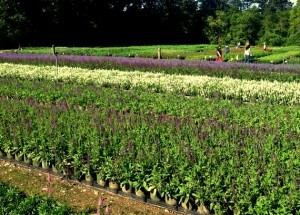 There are several cultivars available in addition to the white-flowered species in varying shades of lavender and pink. Try ‘Fascination’ or ‘Adoration’ for lilac/pink or ‘Apollo’ for a pastel lavender. We love foxgloves. These stately, nostalgic biennials have been a stalwart of the early summer cottage garden for ages. Their spires of unique, bell-shaped flowers bring a magical quality to any mixed planting. On the island, they are equally happy in sun or shade. 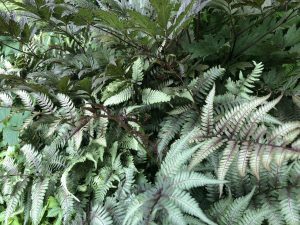 The tall varieties tower over the back of the border, while the more compact selections are suitable to mingle with lady ferns and hostas at the edge of shady paths. 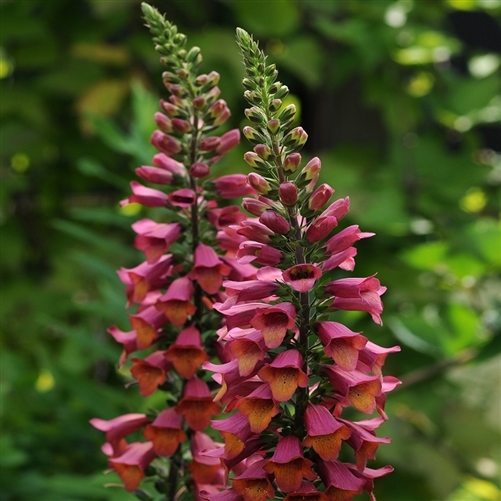 In recent years, there has been a break-through in hybrid foxglove. 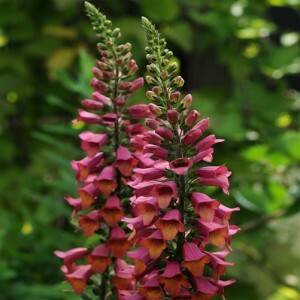 DIGIPLEXIS is the result of an inter-generic cross between Digitalis and Isoplexis, a shrub indigenous to the Canary Islands. The resulting hybrid retains positive attributes from both plants. They bloom in their first year on well-branched plants, with a stunning depth of color for the entire summer! Digiplexis ‘Illumination Flame’ was the first on the scene. Bred by Charles Valin at Thompson & Morgan in the United Kingdom, this plant bears many spikes of flame-colored flowers from late spring to fall. The hybrid nature of this plant makes the plant sterile, so there is no fear of volunteers. Although Digiplexis is technically a perennial, gardeners on Nantucket haven’t had much luck wintering them over in the ground. The best bet is to plant them as annuals and enjoy their stunning flower display for a summer, replanting them the following year. They make a fantastic statement in pots, or in mixed perennial beds, where no other plant can perform quite as they do. We’ve gotten more and more into growing at Surfing Hydrangea over the last few years, so I thought I would give Digiplexis a try. We’ve grown a great crop of ‘Berry Canary’. This plant was introduced by Walters Gardens in the United States in 2014, and promises to be just as floriferous as the original. The hot pink flowers on ‘Berry Canary’ have a creamy, speckled throat. 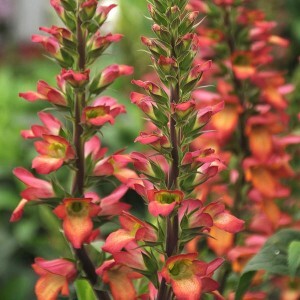 This selection is somewhat more compact than ‘Illumination Flame’, touted to grow only a few feet tall. This more proportional habit may make it suit containers even better than ‘Illumination Flame’. We still have a few left, why not give them a try?! The popularity of this new plant has begun a breeding frenzy. We expect to see more and more new varieties coming to market each year. Check out the Foxlight series introduced last year. We’ve got Foxlight Ruby Glow in stock as well. Have you ever been weeding an endless, blinding, white shell driveway to find yourself carelessly throwing weeds into your bucket as if they have no value? Frequently, we find ourselves valuing some plants over others because of what we’ve learned as landscapers. Our view of plant life is formed by some old rule where one plant belongs and another doesn’t. As it turns out, nearly every plant has a value beyond its ornamental purpose. You just have to think outside of the landscaper’s mindset. How exciting! To a landscaper, weeds pulled during summer maintenance are little more than busy work. However, in the eyes of an herbalist, these same plants are highly valued for their essential vitamins, nutrients, and exponential healing qualities! Humans have been using plants as medicine for thousands of years; though recently, we have lost touch with our intimate knowledge of, and connection to the plant world. While much knowledge has been lost over time, modern people are rediscovering the many medicinal properties and uses of plants, re-establishing our necessary relationship with the natural world. 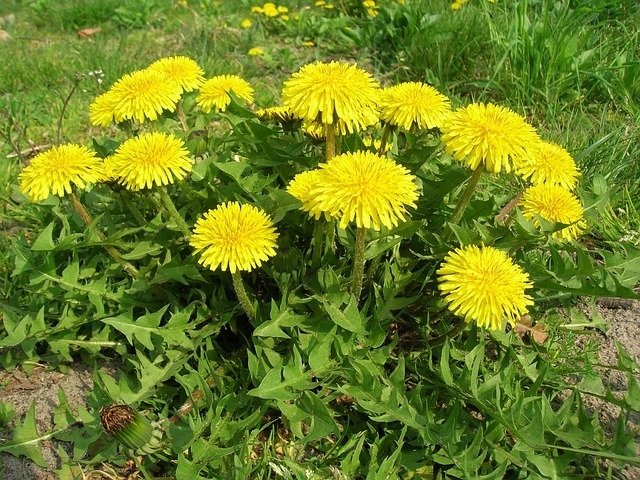 Dandelion, Taraxacum officinalis, is probably one of the most recognizable weeds and can be identified by its bright yellow flower and hairless, dark green leaves. The plant’s tap root can be processed into a tincture, tea, or oil infusion. As a tea or tincture, dandelion root works to cleanse the liver, aid digestion, and ease pre-menstrual symptoms and menstrual bloating. The flowers, when drank as a tea, help to hydrate skin. When applied topically, an oil infusion of the flowers can soothe sore muscles and facilitate stress release from the body. Dandelion leaves are edible and high in vitamins and minerals. Plantain, Plantago major, goes hand in hand, or tap root in tap root, with our friend the dandelion. It can be identified by its broad, rounded, glossy leaves, with small, greenish flowers. 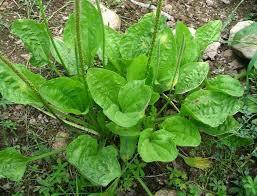 Plantain is most effective when its leaves are administered as a poultice. A plantain poultice works to stop the bleeding of minor cuts, ease pain from bee stings, and prevent swelling. Topically applied, oil infusions of plantain work to quickly heal cuts, bruises, scratches, stings, and rashes. Another delightful, medicinal tap root is burdock, Articum lappa. It can be identified by its large leaves with red stalks, and wooly undersides. When processed into a tincture, burdock root is a supreme liver, kidney, and blood purifier. As a tonic, burdock cleanses the lymph, sweat, and oil glands. When applied topically as a poultice or oil infusion, it can heal heated skin conditions such as acne, rashes, eczema, and burns. 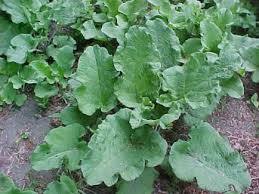 Although not the tastiest of root vegetables, when eaten, burdock improves intestinal flora. Chickweed, Stellaria media, can be identified by its small, white flowers and low, dense, creeping green foliage with a single line of hairs on its smooth stalks. 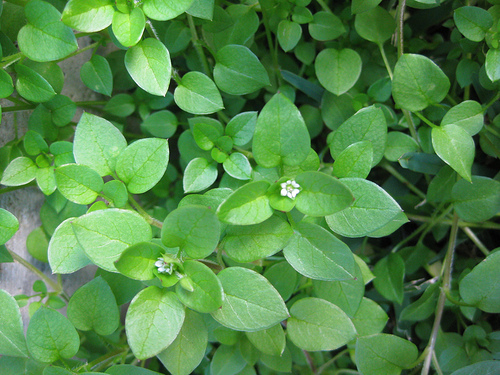 Chickweed is most commonly eaten as medicine, packed with essential nutrients, such as calcium, potassium, protein, and vitamin C, to name a few. When taken as a tea or tincture, chickweed cools heated chest congestions and eases bladder and kidney discomfort. Applied topically as a poultice or oil infusion, chickweed draws out infection, decreases swelling, and heals minor injuries, itches, bites, sores, bruises, and blisters. And last but not least, yarrow! 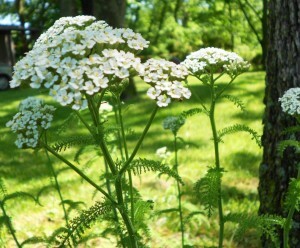 Yarrow, Achillea millefolium, can be identified by its feathery, sprawling leaves and flat, composite, white flowers. While there are many beautiful, brightly colored hybrids of yarrow in our gardens, only the wild, native variety found in meadows is medicinal. Yarrow is traditionally used as an antiseptic poultice for wounds, drawing out infection and stopping bleeding internally and externally. Yarrow’s flowers can be taken as a tea to stimulate the immune system at the onset of a cold or flu, control fevers, and promote sweating from colds and flues. In tincture form, yarrow flowers work to boost the immune system and serve as a digestive aid and liver cleanser. This is just a glimpse at a few of the medicinal qualities of the common weeds found on Nantucket. We have found that these are not weeds at all, but nature’s medicine waiting to be eaten, drunk, or slathered all over our aching, over-worked bodies. So next time you’re hustling through a garden bed, thoughtlessly adding weeds to your compost pile, think again! That dandelion could help your hangover, that burdock could erase your acne, that yarrow could cure your cold. Tincture: The product of infusing alcohol with plant material to withdraw the medicinal qualities of the plant into the alcohol, commonly taken orally for internal purposes. Have you ever heard the saying, “Nature abhors a vacuum”? This idea can be applied to a lot of natural phenomenon. In the North East, Mother Nature just loves to fill up empty areas of disturbed soil with plants. In fact, it’s very uncommon for bare earth to be found in any naturally occurring ecosystem on the island. I often wonder why so much time and effort is spent on applying shredded bark mulch annually to cover the bare soil left in garden beds. 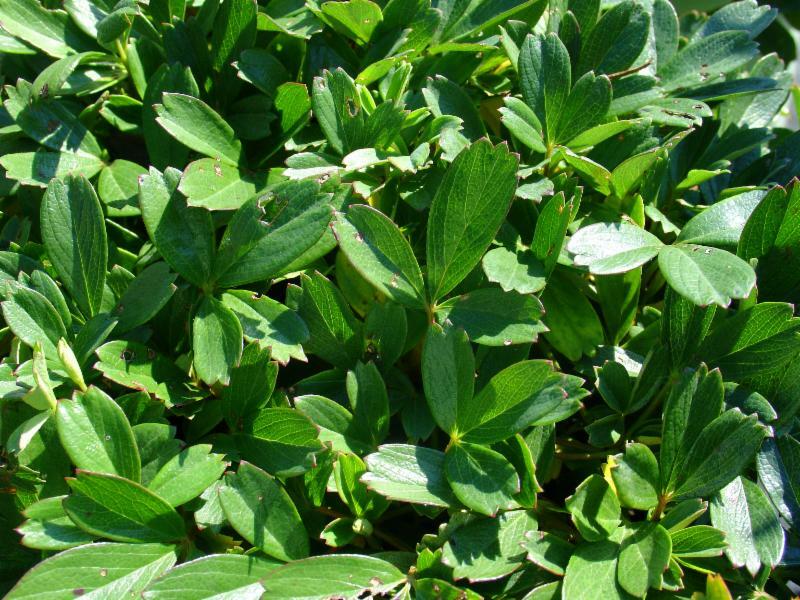 Truthfully, living groundcovers do the same job more effectively and for years without any additional input from the gardener. A great groundcover common from the Arctic all the way south to Georgia is Three-toothed Cinquefoil. The leaves of this tough little plant are reminiscent of alpine strawberries, but are evergreen, taking on hues of red in the fall and winter months. Clear white, buttercup-like flowers appear in late spring. This Potentilla is classified as a woody plant, as it does have 3-6″ woody stems. Plant Potentilla tridentata in sandy or gravelly soils with excellent drainage and little water. It would be quite at home next to native grasses and sedges, like Carex pensylvanica (Pensylvania sedge) or Schizachyrium scoparium (Little Bluestem). 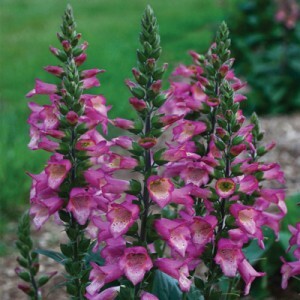 Or try planting it as a drift in a more prominent area of the garden that is not irrigated. Note: This plant has recently given it’s own genus and species. The new name is Sibbaldiopsis tridentata. Scientists estimate that there are 10 quintillion insects on the planet. That’s 10,000,000,000,000,000,000 individual creepy crawlies! And, boy, do they like to eat! From early spring to late winter, it is extremely likely that someone is dining your prized plant’s leaves, stems, or roots. Control of insects in the garden is a hot button issue. Often times gardeners are tempted to use strong insecticides as soon as they see a single bug. Hell, I’ve been known to grab a spray bottle of Sevin myself from time to time. Luckily, we’ve all gotten much more sensitive to the fact that beneficial insects are also living in and working for us in our gardens. In order to minimize the use of poisonous chemicals and the destruction of beneficial insect populations, it’s extremely helpful to know what kind of insect is causing the damage you see. When it comes to identifying which insect is causing the problem, there are a few ways to go about it. The first is to research the plant where most of the damage is occurring. 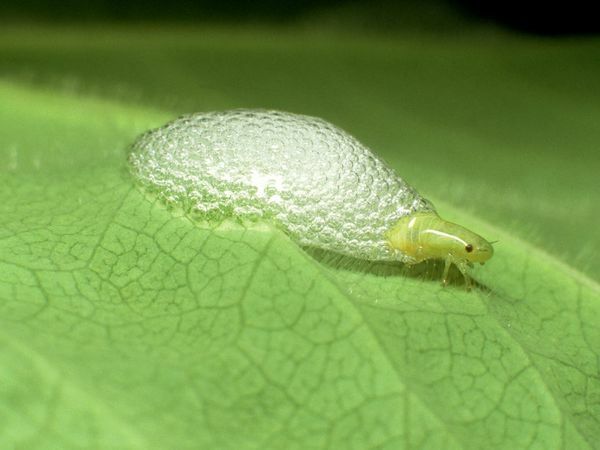 Many plants are susceptible to particular buggies. Those plants can become infested with hundreds of insects of a single type. For example, roses are well-know to harbor aphids. Every year at the nursery, I fully expect to see them by June, and begin to check all the roses for this pest. I’ve researched many different ways of killing them, but I most often use an organic method that I was taught years ago. I just put on a gardening glove and squish them! Since most of the aphids cluster on the tips of the new growth, I can easily murder 90% of the population in one go. A second squish-a-thon a week later, and the population is at such a low level that’s it hard to notice any further damage. The second way to determine what is eating your plant is by studying the damage itself. My favorite “Bug Book” is Garden Insects of North America, by Whitney Cranshaw. This book breaks down the feeding patterns of insects into 9 categories, and gives a very extensive list with great pictures. Keeping roses as the example, I noticed a number of holes in the leaves of some ‘New Dawn’ roses recently. I open up my trusty Garden Insects of North America and turn to Chapter Three, “Leaf Chewers”. Unfortunately, I have not seen the actual insect feeding on the leaves, so I can’t really settle on a specific pest yet. 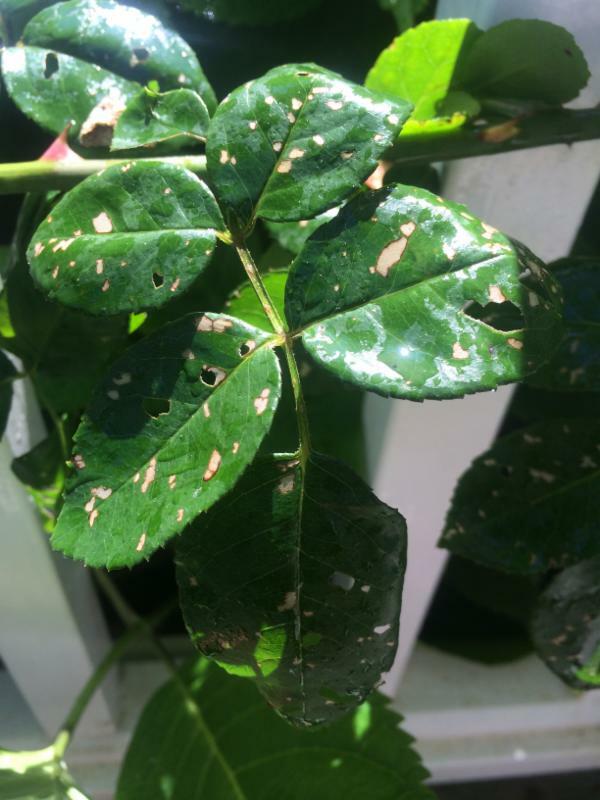 I flip to another great book in my library, The Organic Gardener’s Handbook of Natural Insect and Disease Control by Barbara Ellis and Fern Marshall Bradley, to see what insects commonly cause this kind of damage on roses. Now it becomes process of illumination. I know it’s not Japanese Beetles, because they are large, and feed during the day – I would have seen them, and the damage would have been more serious. I also rule out large caterpillars, because they also feed during the day, and leave behind noticeable droppings, which I should have seen clearly. It’s likely that the damage on these leaves is some sort of sawfly larvae or rose chafer. Most of these leaf-eaters are already done feeding for the season, and should not cause further damage. So, in this case, I will wait until next June, and begin to pay very close attention to the leaves. At the first sign of the pest, I will apply an appropriate insecticide. leave them alone because of their pungent smell and slightly hairy leaves. Plant them in average, well-drained soil in a sunny spot. Care is also easy: after the frost, cut down the wizened foliage. To keep the plant looking fresh all season, cut the spent flower spikes back to the basal foliage in mid-summer. 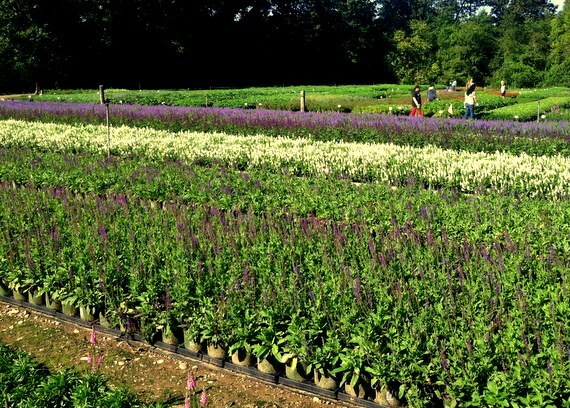 Many cultivars will reward the gardener with a second flush of bloom. 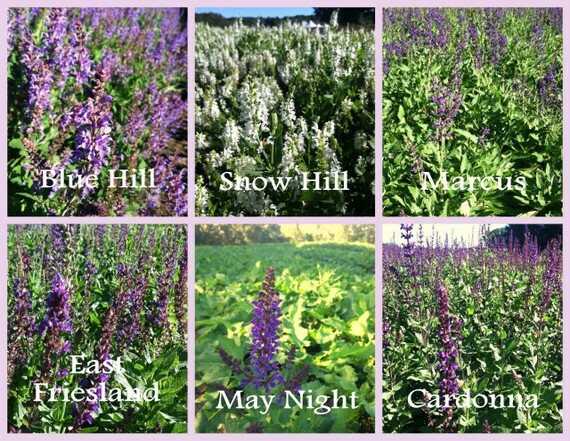 During our recent trip to Connecticut to visit one of our growers, I was excited to see fields and fields of Salvia in bloom. It was the perfect opportunity to make a collage comparing them. Their attributes are listed below, along with the collage. ‘Blue Hill’: Dense spikes of true blue flowers. 1.5 – 2′ tall. Blooms June-July. 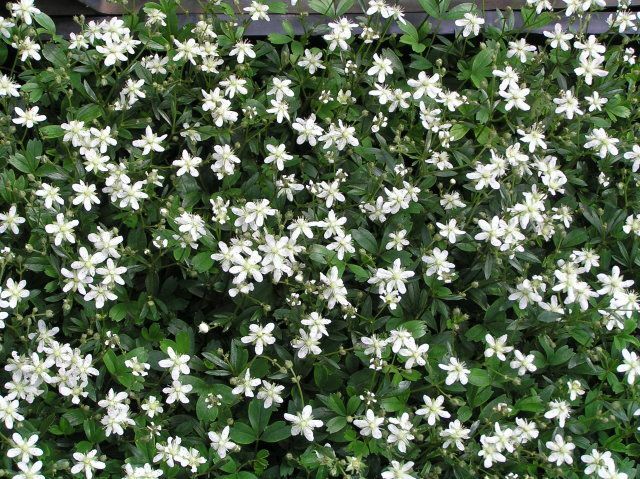 ‘Snow Hill’: White flowers on compact plants. 1.5′ tall. Blooms June-July. ‘Marcus’: Deep blue flowers on dwarf plants. 8-12″ tall. Blooms a week or more after other cultivars. ‘Mainacht‘ aka ‘May Night’: Dark purple flowers. 1.5′ tall. Blooms June-July. Dependable re-bloomer. ‘Cardonna’: Black flower stems, violet flowers. 2-2.5′ tall. Blooms May-July. A personal favorite. foliage is also lovely. In the morning, the leaves are covered in drops of dew that sparkle in the sun. These plants blend equally well with sun and shade combinations. 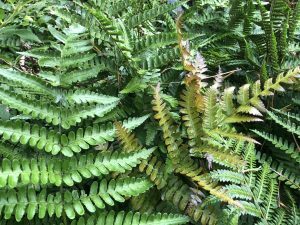 Plant them as a low edging along a shady path with ferns as a background or in the front of the perennial border with catmint or small grasses. 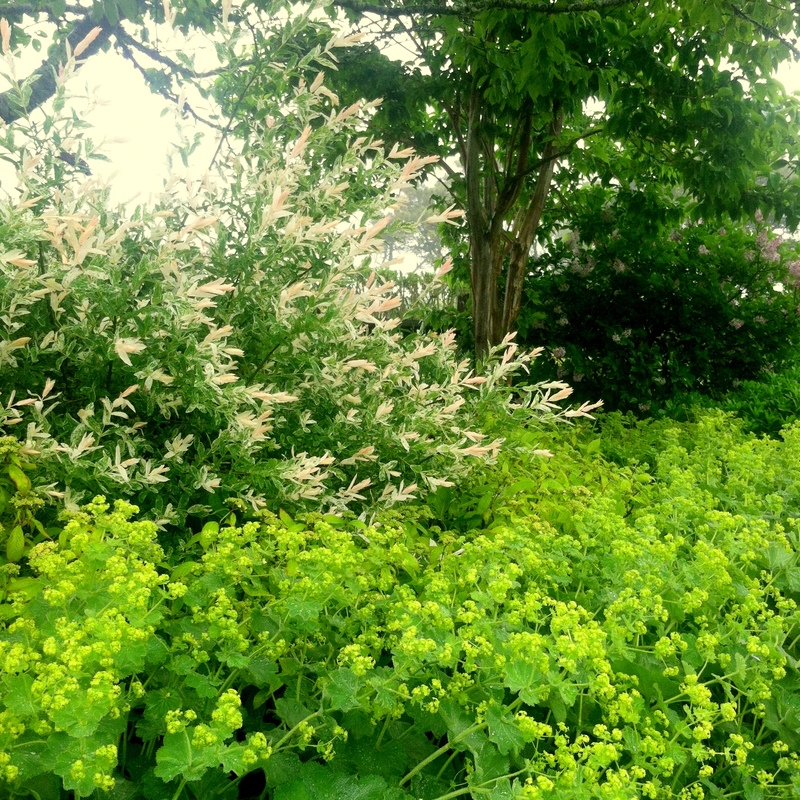 Alchemilla likes a spot with average soil and even moisture. In my experience, the foliage holds up the best in plantings that have some afternoon shade. Maintenance is easy. Once the flowers have begun to turn brown, remove them. 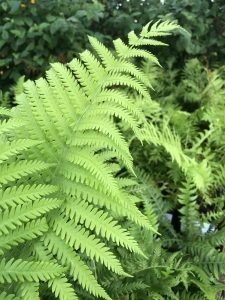 There are a few ways to do it;either shear back the entire plant, allowing the basal foliage to grow and fill back in, or cut or pull the stalks away from the base of the plant. While dormant, cut back the foliage to the ground. Alchemilla mollis: The most common species of Lady’s Mantle. Leaves are 6″ wide. Flowers tend to fall toward the outside of the plant when in full bloom, forming a mantle or skirt – hence it’s common name. 18″ tall to 24″ wide. Alchemilla mollis ‘Thriller’: Slightly larger than the species, possibly with even more flowers. 18-24″ tall and wide. Alchemilla mollis ‘Auslese’ aka ‘Select’ and ‘Robustica’: A dwarf form. Compact plants hold flowers in a more upright fashion than other Alchemilla mollis cultivars. 12″ tall and 18″ wide. Alchemilla sericata ‘Gold Strike’: A compact species, 14″ tall. Medium-sized, deeply scalloped leaves. Flowers tend to stay upright. Alchemilla erythropoda: The smallest species of Alchemilla that is readily available. Perfect for a tiny garden. 6-8″ tall.